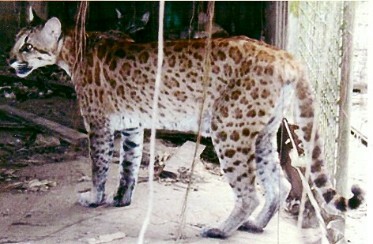 Prior to the ocelot x puma hybrid cubs, the puma had only been hybridized with the jaguar (alleged) and the leopard (confirmed). Meanwhile, the only confirmed hybrids involving ocelots were those between an ocelot and a margay ("marlots"). When keeping wild cat species together (because of shortage of space) it is rare for a larger cat to be housed with a much smaller one - the larger cat might easily consider the smaller one prey! 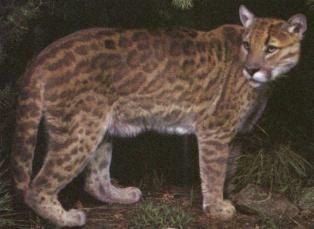 Ocelot-Puma hybrids were reported by G Dubost & J Royere in 1993 in "Zoo Biology 12". The parents were a captive male ocelot and a captive female puma living in a private collection. The puma and the ocelot had shared a single enclosure in a collection in French Guiana since 1986 when they were raised together. The puma was approximately three times the size of the ocelot - she would have needed to co-operate in order to mate with him. They produced four litters of hybrid offspring between 1990 and 1992 and possibly an earlier litter in 1989. In September 1989, when the female was slightly over 3 and a half years old, the puma seemed to be pregnant. No litter was observed. In May 1990 she gave birth to 3 cubs (2 males, 1 female) which all died within a day when their mother failed to care for them. In October 1990 she produced 2 cubs (1 male, 1 female) and there was an attempt to hand rear these. They survived to 5 days and 12 days old, apparently dying because the appropriate formula food was not available. However this showed that ocelot x puma hybrid cubs are viable and likely to survive if properly hand-reared or fostered. In 1991 three female cubs were born and failed to survive. In 1992, a fourth litter was born but vanished within one day - presumably eaten by the mother since she had shown poor maternal instincts with earlier litters. Quite possibly she had given birth in 1989 and done the same thing. 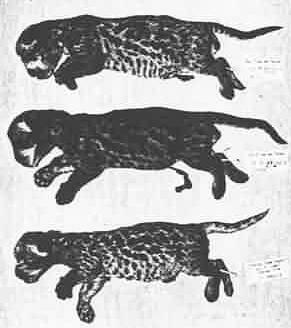 The body size and spot pattern of the offspring were intermediate between those of the parents, though they more closely resembled the male parent (ocelot) than the female parent (puma). The offspring showed a variety of patterns, all reminiscent of an ocelot rather than the juvenile pattern of a puma. The cubs' markings was similar to that of an ocelot but with less continuous on the back and with less pronounced throat/belly markings The backs of their legs were darker and unspotted (a puma-like trait) and their tails ringed. As well as demonstrating that ocelots and pumas were related closely enough to produce offspring, the mating showed that body size was not an issue in hybridization and also that the male did not have to physically dominate the female (the same is true of leopard/lioness matings where the lioness adopts a lying position to permit the smaller leopard male to copulate with her). In cats with different body sizes, there is often a difference in gestational period i.e. longer in the larger species. This can result in the young being stillborn. if carried by the smaller parent they are born premature relative to the larger parent's gestational period. if carried by the larger parent, they may be overdue relative to the smaller parent's gestational period. However, the cubs were demonstrated to be viable. Their bodies were examined. Though larger than newborn ocelots they were not as heavy. Pumas have relatively long tails and the cubs' tails were longer than that of an ocelot, though not as long as that of an puma. In one litter, the cubs had unusually short tails. Very probably, their small size did not trigger the appropriate maternal instincts in the puma. They would also have been relatively fragile and easily harmed or accidentally killed by their large mother. Why were they so small, even compared to purebred ocelot cubs? As with tigons and ligers, growth dysplasia related to the reproductive habits of the two species might mean that female pumas inhibit the size of their offspring while the ocelot male does not have the mechanism to compensate for this i.e. his genes do not promote large offspring. This would explain why the hybrid cubs are smaller than normal ocelot cubs - their size has been inhibited by a non-ocelot female's genes. Three of the ocelot x puma cubs. The umbilical cord is still attached, showing that these were no more than a few days old. Patterns range from marbled through to spotted. Artist impression of a mature ocelot x puma hybrid - intermediate in size and type, but bearing an ocelot-type pattern in chestnut brown on a fawn background. In captivity, the ocelot hybridizes with the other small South American spotted cats such as the Margay (L. wiedii), Tiger cat (L. tigrinus), Geoffroy's cat (O. geoffroyi), and the kodkod (Oncifelis guigna), but they do not interbreed in the wild (Newman et al., 1985). I have been asked if puma/bobcat or puma/lynx hybrids are possible in the wild. This followed the appearance of an apparently “nearly puma-sized” cats with the short tail and pointed, white-marked ears of a bobcat, but the tawny coat of a puma. There are no authenticated hybrids between the two species. According to the Greenfield Daily Reporter, January 18,1937, "[Menagerie owner] Dr. Lorenz says he has [. . . ] a hybrid cat with characteristics of mountain lion, lynx and bobcat [...]" but this was an unverified hybrid and did not describe the exact characteristics. Bobcats are variable in their markings. Although most people are familiar with spotted bobcats, those spots can be so small as to be speckles; from a distance, such cats may look solid-coloured. Like the puma, the bobcat can also have a white muzzle and “eyeliner” markings. The presence of a frill, even a light one, around the neck confirms that the pictures show a large, rather gracile bobcat with speckled markings. Another giveaway in favour of the bobcat is the short white-tipped tail and lighter muscling of the hindquarters. Sometimes you get bobcats that haven’t developed a ruff, or frill (in the same way you sometimes get lions that don’t develop a mane). Without the ruff altering its profile, bobcats have rather long necks and smallish heads, which combines with the spotted or speckled body to give a rather cheetah-like appearance. Seen in profile, the bobcat has a narrower, sharper nose, compared to the broader, more rounded features of the puma.